Home A Letter from the Director: "We Hold These Truths to be Self Evident"
Billboard on display outside of the Flagg Building's 17th Street Entrance features statements made by current and former male politicians. I hope this note finds you well. Today, the Corcoran School of the Arts and Design at the George Washington University will be opening a new installation titled “We Hold These Truths to be Self Evident” by artists Zoë Buckman and Natalie Frank. This project has two parts: a billboard outside the Flagg Building 17th Street entrance and a mural in the Rotunda Gallery. This work features statements by current and former male politicians from across the political spectrum about women and their bodies. The artists have described their intent as wishing to illuminate the pervasive misogyny that exists in our political system. This project and the timing for this was chosen to spark civic engagement and will stay up until December 15, 2018. The Corcoran partnered with For Freedoms around their 50 State Initiative to show this work. For Freedoms is a network of over 300 artists and 200 institutional partners who are producing and curating nationwide public art installations, exhibitions and local community dialogues in order to inject nuanced, artistic thinking into public discourse around and after November’s elections. I believe that showing Buckman and Frank’s work is a teachable moment for the Corcoran as it shows the power of creative practice as being able to provide piercing insight into pervasive sexism and misogyny that exists in our political leadership. We Hold These Truths To Be Self-Evident, the title of this piece, is taken from Elizabeth Cady Stanton's "Declaration of Sentiments and Resolutions," delivered in 1848 at the first women’s rights convention in Seneca Falls, New York. The title of this work demonstrates powerfully that these struggles for equality and accountability have been hard fought and ongoing. Because the Corcoran is an institution dedicated to educating the next generation of cultural leaders, it is imperative that we clearly support the dialogues and works that bring attention to the inequity that we see in the systems around us in order to show our students the powerful opportunities they have to leverage creativity as a tool for change. 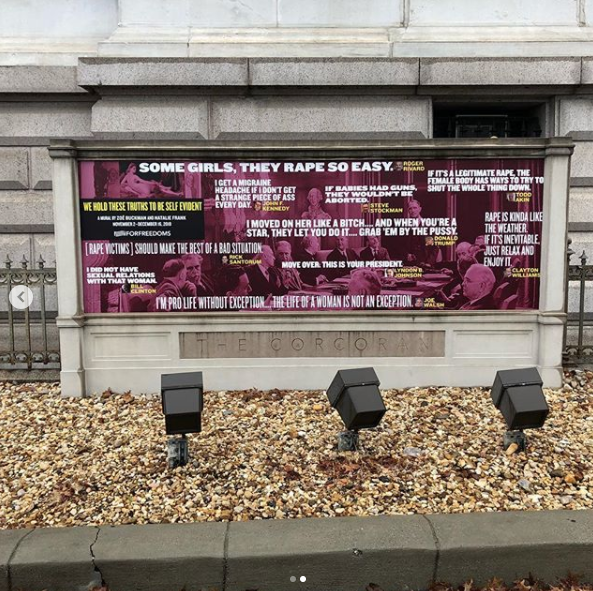 While we hope that this display will encourage provocative and productive conversations, we also recognize that the exhibition may be difficult to look at for many people, particularly survivors of sexual assault. As a result, viewer discretion is advised. We suggest that those wishing to avoid viewing the installation enter the Flagg Building through the New York Avenue entrance, and to walk around the Rotunda where it is on display inside our building. To that end for those of you struggling with issues related to sexual assault, we are committed to having you get the appropriate support: GW’s Haven offers resources related to sexual or gender-based harassment, sexual assault, sexual exploitation, intimate partner violence and stalking. You can find out more about Haven’s events and resources here. We’re currently developing programming with Haven for students here at the Corcoran. We hope that you take a moment to view this work and think about ways that you can engage in these pressing social dialogues that surround us. I would love to hear your thoughts on other projects and areas of engagement that we should consider for future programming. As always, please do not hesitate to reach out to me with any questions or concerns. Scroll to the bottom of this article to see the full piece. 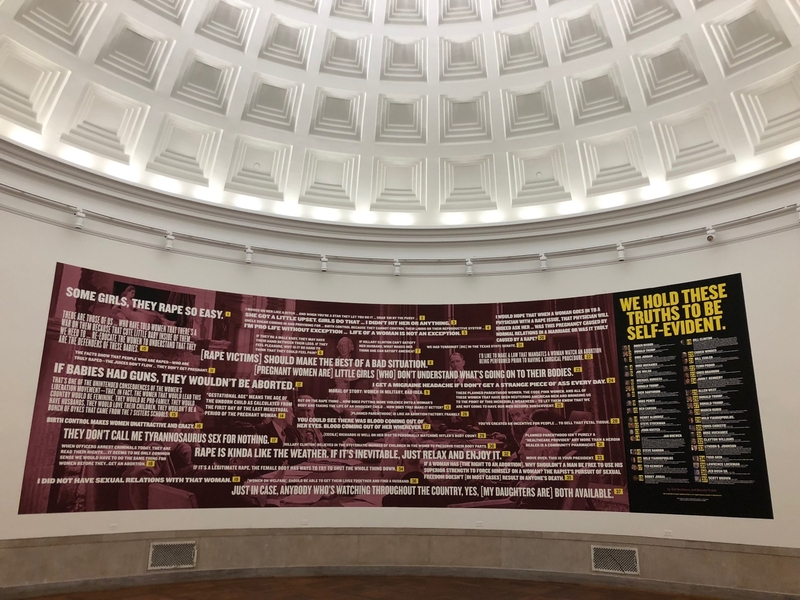 Installation in the Corcoran rotunda space features statements made by current and former male politicians.